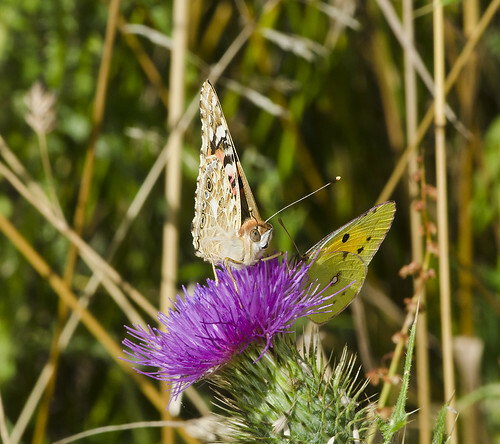 A Painted Lady and a Clouded Yellow share a thistle. Today we have a guest photographer. All the photos are taken by Penguinbush who may be known to erstwhile readers as Mr. Stripey. He holds copyright so please contact him before using these shots anywhere else. After several weeks of glorious summer weather my dire expectations in the spring of butterfly apocalypse have been shown to be overly pessimistic. We've had a reasonable showing of all the usual suspects and really excellent numbers of some native species like the skippers and Silver Washed Fritillaries. Some warm southerly winds in the last few weeks have also bumped up the number of migrants and casual visitors; butterflies that expand their range during the summer but rarely breed or survive the winter this far north. 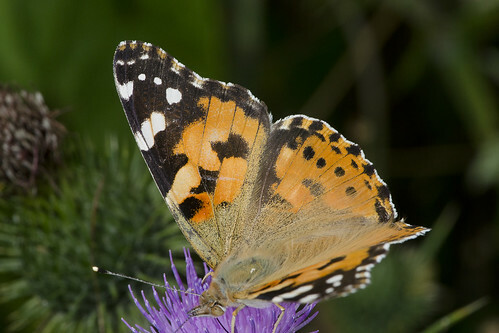 Painted Lady feeding on its favourite food, the thistle. The Painted Ladies (Vanessa cardui) are true migrants, very widely distributed over the world. The ones we see here breed year round in Northern Africa and the warmer parts of the European continent and fly north via circuitous routes towards Britain and Scandinavia during the summer where they feed and breed on the fresher food supplies. Until recently it was believed they never tried to return south as the weather turned to autumn but new research suggests that they do, flying at very high altitudes on the wind to help them along their way. A Red Admiral basking in the warm sun. 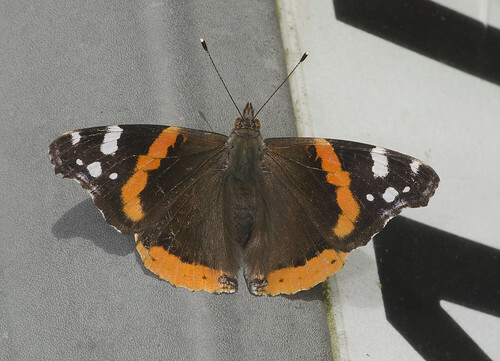 The Red Admirals (Vanessa atalanta) can and do breed in Northern Europe and the UK but they are sensitive to the cold and have trouble surviving the winters. 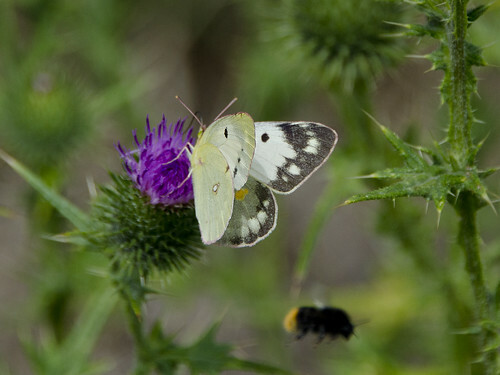 Luckily enough do survive for them to be considered natives and they are replenished each year by new butterflies coming north from Central Europe which helps keep the numbers up. Nobody seems to know if these travelling butterflies have babies that make the trip south again but perhaps, like the Painted Ladies, this will be discovered eventually. 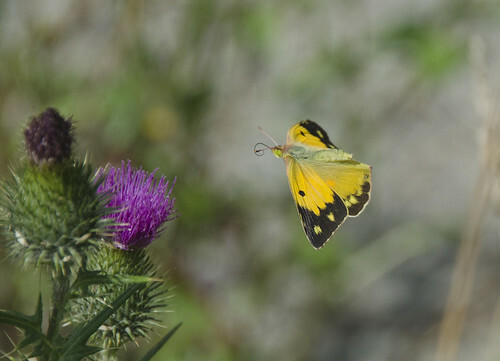 Clouded Yellow in flight. These brilliantly bright butterflies rest with wings folded so it's difficult to get a shot of the upper sides like this. Clouded Yellows (Colias crocea) were new to us a few years ago, we'd never seen them before in the UK or France but they have long been known as occasional migrants sometimes appearing in huge numbers. 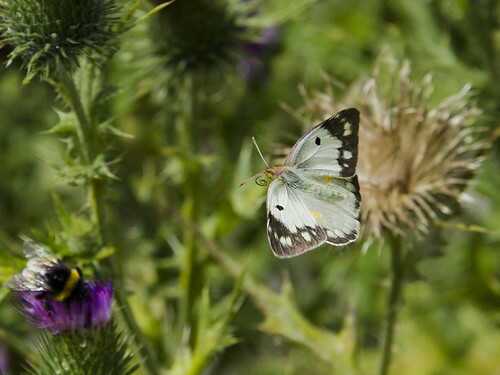 In a good year butterflies come north, again from the Mediterranean and North Africa, breeding and expanding their range in waves as long as the weather remains clement. The last larvae sometimes manage to overwinter on the south coast of England but usually the cold finishes them off. Again, it's not really known if any make a return trip to the Med as autumn comes on. Pale Clouded Yellow, just like the Clouded Yellow but much paler. About to fly away this shows the upper and underwing patterns. 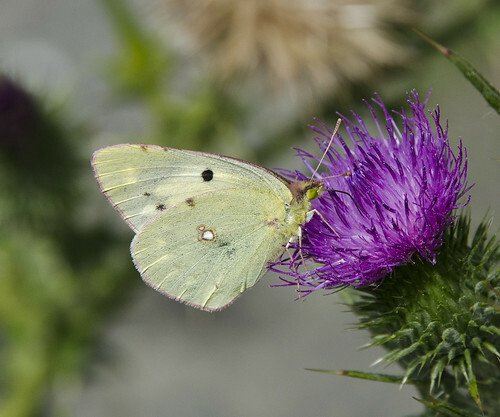 This is our new species for the year, the Pale Clouded Yellow (Colias hyale). Another very rare visitor that only expands north when conditions are just right. We're as confident as we can be for the identification on these - there are variants of the Clouded Yellow and other species of Colias which are very similar and can really only be distinguished at the larval stage or by catching and examining in close detail which wasn't what we wanted to do to such welcome guests. The Pale Clouded Yellow in flight. Those are clearly Pale Clouded Yellow. I saw a couple in 1983 when there was an invasion of migratory species during a hot summer. Thanks for the confirmation, Robert. We've been having a splendid spotting year. What is the butterfly equivalent of a twitcher anyway? Hope all is well with you.